And there’s no room for old friend Thierry Henry. 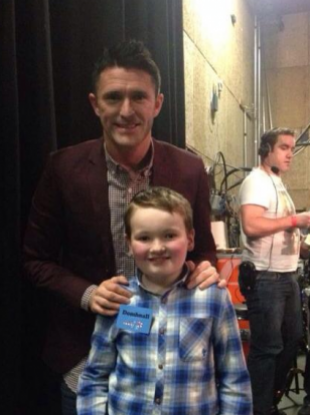 Robbie Keane after the Late Late Toy Show with young guest Domhnall O’Confhaola. IRELAND’S RECORD GOALSCORER Robbie Keane of the Los Angeles Galaxy and Australian midfielder Tim Cahill were among six players from outside North America named in the Major League Soccer Best 11 tonight. The lineup of the US and Canadian league’s top players at each position for the 2013 season was revealed four days before Sporting Kansas City hosts Real Salt Lake in the MLS Cup championship playoff final. Keane scored 16 goals and set-up 11 others for the Galaxy, who lost to Salt Lake in the first round of the playoffs. He was joined among Best 11 forwards by his two rivals for the MLS 2013 Most Valuable Player Award — US striker Mike Magee of Chicago and Italian attacker Marco Di Vaio of Montreal. Di Vaio netted 20 goals while Magee, who joined the Fire after being traded from the Galaxy in May, plundered 21 goals. Cahill, a 33-year-old from Sydney who played for Everton from 2004 through last year, scored 11 goals and helped the New York Red Bulls claim the best regular season record in MLS this year. Among those missing from the top-11 lineup were Galaxy striker Landon Donovan, snapping his run of five appearances in a row on the squad, and Vancouver forward Camilo Sanvezzo, who led the MLS with 22 goals in the regular season. New York striker Thierry Henry, who made the team the past two years, was also overlooked. Email “Robbie Keane makes MLS team of the year”. Feedback on “Robbie Keane makes MLS team of the year”.